The plane is a Boeing 737-800 which is scheduled to be upgraded in 2018 to a Boeing 737 MAX 8s. 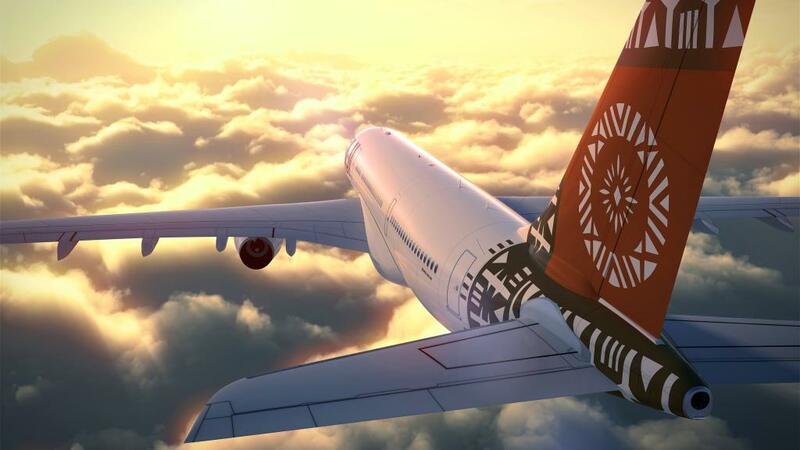 Flights to Fiji take approximately three to four hours depending on where you’re flying from. Services from Sydney depart twice daily while flights from Brisbane depart daily. Services from Melbourne depart five times a week and from the end of June, Adelaide will also have a direct service twice a week. The perks of being a business class passenger begin with your baggage allowance, with 30kg of checked baggage (7kg more than economy) and two 7kg carry on pieces (twice that of economy). The VIP treatment continues with a boarding line dedicated to business class passengers, who are invited to board before the rest of the main cabin. Once onboard, it’s easy to find your seat as the friendly cabin crew help to direct you to one of just eight seats in the business class cabin. Set out in a two by two layout, there’s extra legroom to enjoy as well as comfortable La-Z-Boy-style seats which feature a 46cm recline and 122cm pitch. You’re also provided with a Polynesian print pillow and blanket for extra comfort. Pre-departure rum cocktails are served to help you get into the holiday spirit and the Fiji Airways staff reflect the friendly and abundant Fiji hospitality. Kind, obliging and with always beaming smiles, these are some of the friendliest flight attendants in the sky. There’s just enough time to enjoy a movie on this flight and an iPad 2 is provided for all business class passengers to watch latest release Hollywood blockbusters, the hottest TV shows as well as a selection of travel and cooking shows. If you prefer to kick back and give your eyes a rest, there are also audio offerings from new and old stars like David Bowie and John Legend. There’s something to suit every taste and the iPad makes navigation easy. Another great way to pass the time is with food and on the popular morning flights you’re treated to an a la carte breakfast featuring yoghurt, granola and fresh fruit as well as a small pastry followed by a choice of Belgian waffles, scrambled egg crepes or a vegetarian rosti. Coffee, jasmine green tea and bottled Fiji water are all part of the selection as well as some lovely Australian and New Zealand white wines and a French NV brut. The three hours to Fiji will fly by and you’ll be wishing the flight was a little longer so that you could enjoy the good food, entertainment and friendly staff for just a little bit longer. It’s the perfect way to start your holiday and avoid spending your first couple of days in Fiji trying to unkink from the flight.